SACRAMENTO REGION, CA (MPG) - A business that began on a Carmichael street corner is now one of Sacramento’s most geographically far-flung enterprises. In days of full-service, the boss pumped gas and employed mechanics for repairs. He mopped floors and cultivated a personal touch with customers. When daughter Annie (now Marszal’s development executive) was born, he covered his macho premises with pink ribbons. “That got us in the newspaper and brought new customers,” he says. “People like family businesses. I still have full-service available at all our stations; we make sure someone will always run out to help a customer. We’ll never charge for air or water. Cashiers are the most important people in our company. Being nice is not something you can teach; but friendliness determines whether a customer comes back. Outside Sacramento, the family now has stations in Maui, Oahu, Nevada and Ohio. 2019 plans include a new El Dorado Hills outlet. The founder and Susan -- his wife of 37 years -- live quietly in Carmichael. Their national operation is run from an anonymous building near Manzanita Avenue. 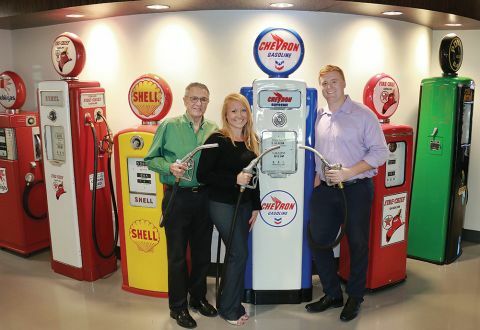 In 40 high-octane years Marszal has seen oil companies and retailers come and go. “Many of our competitors lost their focus on service,” considers the survivor. “Over 40 years, service is what constantly opened doors for us to gain more customers.